With the FIFA World Cup set to dominate the sports stage for much of the next month, a new study offers details to suggest that soccer figures to be a topic of conversation in Canada for years to come. 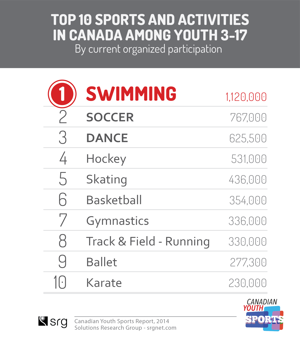 According to the Canadian Youth Sports Report released Tuesday by Toronto's Solutions Research Group, soccer is the most popular team sport with boys and girls between the ages of 3-17 with 767,000 kids playing organized soccer across the country. Only swimming had more registered participants with 1.1 million. The rest of the top 10 is listed on the right. 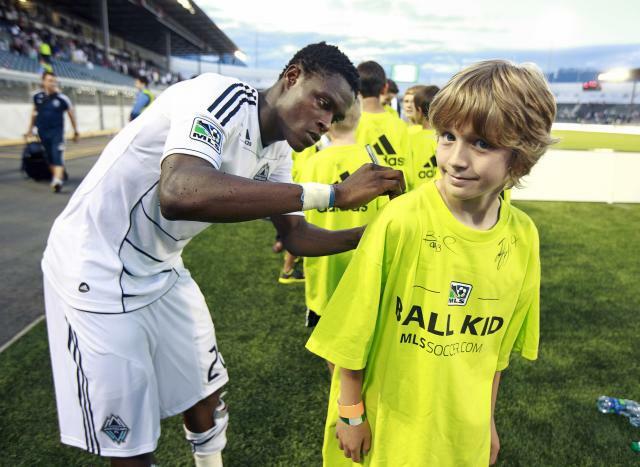 There are several reasons why soccer is on the rise in Canada. For many families it is a relatively affordable way to get their kids involved in sports, costing an average of $675 per child per year, much less than the average cost to register kids for baseball ($1,115 per year) and hockey ($1,666 per year). Another factor has been the recent influx of immigrants into Canada. Soccer is the preferred sport for first-generation Canadians, which has provided a huge boost to the game at a grassroots level. A positive perception around the sport is also helpful. The study states most parents associate soccer with "fun", as opposed to hockey, which is seen by some as having "some pushy parents in kids leagues," and that due to the physical nature of the sport, it is “easy to be injured participating." While it has yet to be reflected in this year's TV ratings, the study also reveals that MLS is the second most popular professional sports league in Montreal and the third most popular in Vancouver. The interest can also be found on social media, where the following World Cup ad from Nike has been shared more than 3,200 times on Twitter and viewed over 15 million times on YouTube. A younger demographic is being drawn towards soccer thanks to its financial benefits, an insurgence of new talent, and a generally supportive environment that surrounds the beautiful game. Soccer is growing in Canada in a truly distinct Canadian way, and while Canada hasn't competed in the World Cup finals since 1986, if this current trend among Canadian youths continues, it will be back on soccer's world stage sooner rather than later.